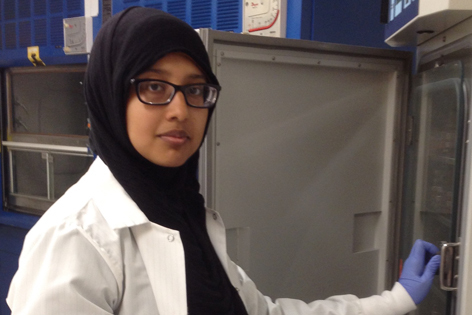 Nabila Haque is six years into her educational journey to become a physician-scientist. Nabila Haque spends a lot of time questioning what makes things work. On this particular day, however, as she paced the airport waiting for her plane to arrive, the question was personal: Should she go to medical school or pursue a research career? Haque loved helping patients at the Mariam Clinic in Raleigh, NC as a Duke University undergraduate. On the other hand, she was energized by her work as a research fellow, studying the potential for endothelial progenitor cells to treat small vessel coronary artery disease under Duke biomedical engineering professor William Reichert, PhD. Haque’s pastor happened to be at the airport on the same day. When their paths crossed, she explained her dilemma. There was no doubt that she should become a physician, he replied. That led to a new question for Haque: What would it take to train in both areas, combining her passion for understanding fundamental biological mechanisms with the patient skills and compassion that others recognize in her? She found the perfect solution — the UCI Medical Scientist Training Program (MSTP). MSTP is a National Institutes of Health-supported MD-PhD program for people like Haque, who envision careers as physician-scientists. There are currently 47 participating programs in the US—five at California universities. Haque is six years into her long educational journey. It will likely take another two years to complete her graduate program. Then, she’ll finish up with the final two years of medical school. After that, she’ll likely continue on to a residency, and possibly, a fellowship. Currently, she is immersed in research, driven to understand the fundamental mechanisms of gene regulation in cancer and stem cells. Yongsheng Shi, PhD, associate professor of Microbiology and Molecular Genetics in UCI’s School of Medicine, says her novel investigations in his lab are yielding important results. “Nabila found that a specific mRNA processing factor, CPSF100, binds to the promoters of thousands of genes in our genome and many enhancer sequences. This find is potentially paradigm-shifting and has many important implications in our understanding of gene regulation,” says Shi. Her work could lead to new markers and therapies for cancer. As an MSTP participant, Haque is supported by an NIH grant. But, her years-long investigation requires far more funding. Recently, she was named recipient of the Gazzaniga Family Medical Research Award, a nod to her outstanding academic credentials and promising biomedical study. Retired UC Irvine Health thoracic surgeon Alan Gazzaniga, MD, and his wife, Shae, fund the award. Haque is grateful for what this award makes possible. Haque says this funding also gives her the means to attend national and international meetings. There, she can learn what others in the field are doing, gaining insights that expand her perspective on where to take her own studies. Who knows where these new perspectives could lead her? As Shi points out, Haque had little molecular biology experience coming into his lab. Yet, she became the first to optimize chromatin immunoprecipitation and sequencing analysis. In order to do this, she located a key piece of equipment in another department and identified experienced colleagues who could offer technical advice.